If you have heard of Mailbox for iOS and are currently awaiting its arrival for Android, today is not that day. Sorry about that. Although, this app best relates to Mailbox, called Boomerang, an alternative email application that can replace the standard email and Gmail apps that come installed on our devices. Don’t get me wrong, I love the Gmail application for Android, but like everything else, there are things about it that could be a lot better. Boomerang brings a great design, along with some cool features, making it one of the first apps to actually make us consider dropping the Gmail app. The big selling feature is the “Boomerang” itself. If you receive an email, but want to make sure you see it or are reminded of it at a later time, you can simply select to have the app send it back to you at a predetermined time. There are options for later that day, next week and a few other options to choose from, on top of the ability to select an exact time for when you want it. That feature alone is what directly relates this app to Mailbox. 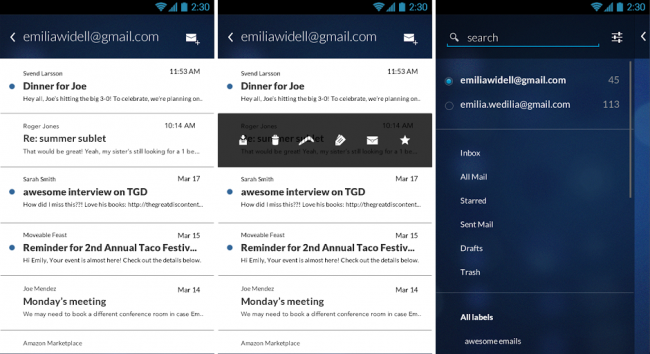 Beyond Boomerang, there are gesture-based controls, much like are already found in Gmail. You have your various folders and different accounts all lined up on the left side in a pull out bar, with quick access to those just a single swipe of the finger away. If you swipe on individual emails, you are given quick options for each message. There is archive, trash, Boomerang, label, star and mark as unread. Depending on which way you swipe the message, a different action will be performed. It’s pretty sweet. Examples of these are previewed in the video below. There are still some issues with the app, as it is brand new and bugs are sure to be present. From my experience when trying to open an attachment, the app comes back with an error stating there is no app installed on my device to open the attachment. Well, I know that’s not true, so it must be Boomerang’s problem. Beyond that, it’s been a pretty decent experience and I’m excited to see what fixes and other features there are to look forward to. Give it a go and let us know what you think. And don’t worry, I know how hard it is to try and stop using the official Gmail app. Nearly impossible.